In this blog post, Tim Vergeer tries to discover the melody of one of the songs in Veranderlyk geval, which was the most popular adaptation of a Spanish play in the Dutch Republic. Veranderlyk geval, of stantvastige liefde (‘Changeable Fortune, or Constant Love’) by Dutch playwright Dirck Pietersz. Heynck premiered on 12 March 1663. It was an instant hit. The play was a perennial favourite and it lists number 3 in the top 50 of plays performed in the Amsterdam Public Theatre (‘Amsterdamse Schouwburg’). The play’s popularity was not without reason. Heynck had, in his own words, made a rhymed adaptation of an original Spanish play, ‘sometimes doing what I then thought proper; not so much overseeing a precise reproduction, but according to [the customs of] our present-day theatre, making it appear somewhat agreeable in the eyes of the spectators’ (Heynck 1663, fol A2v.). Fig 1. Title Page of the 1701 edition of Veranderlyk geval. Amsterdam University Library. Heynck’s play is an adaptation of Mudanzas de la fortuna y firmezas del amor (1649) by the Spanish playwright Cristóbal de Monroy y Silva, which the Dutch playwright changed to cater for the tastes of a sybaritic audience. He was aware of the current fashions and actively applied them in his master piece. Evidently, the play did not meet any of the agreed-upon rules of playwriting. Wat zouw ik vreugt en blydschap vinden! ’t Zou hart en ziel noch vaster t’zamen binden. Doch myn Stantvastigheit en acht geen werelts plagen. Niet wetende wat lot hem staat te wachten. Both strophes are rather lengthy: fifteen lines each, almost unparalleled in Dutch seventeenth-century song culture, where strophes often consist of four or six lines and can go up to twelve or thirteen at most. This unusual length makes one wonder to what melody the song was sung. The play’s stage directions do not make mention of a melody. That should not be a problem, since many other songs in Dutch plays were sung to already-existing melodies, so-called contrafacts. It is, therefore, likely that the melody exists elsewhere in a Dutch songbook. However, most songbooks, including two of the more famous songbooks Amsterdamsche Pegasus (1627) and the Antwerps liedboek (1544) do not include this particular melody. Furthermore, the Dutch database for songs (the Nederlandse Liederenbank) is unable to identify its melody as well. Thus, the precise melody of Margareta’s lamentation remains unclear. Fig 2. 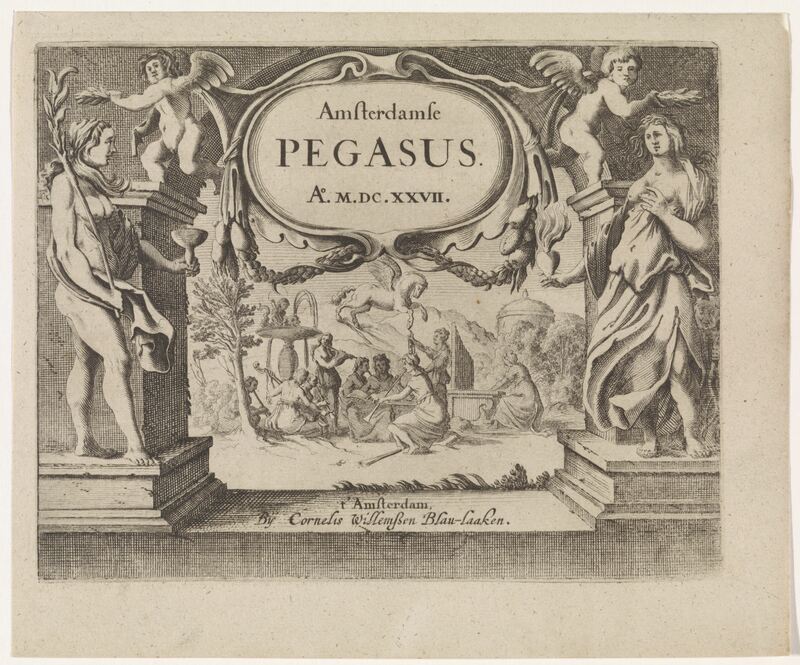 Title Page of Amsterdamsche Pegasus (1627). Rijksmuseum Amsterdam. Otherwise, the melody may not even be Dutch, but Spanish. Did Heynck maybe take the melody from the Spanish original? This is sadly also not the case. In Mudanzas de la fortuna, Margareta had re-entered stage ‘as male, with rapier, under cover of night’ (‘de hombre, con espada, y rodela de noche’). However, she does not sing, but she starts a monologue, saying that like the moon, tears confuse her (‘llantos que me deshazen’), jealousy keeps her awake (‘zelos que me desuelan’), and pains fight her (‘penas que me combaten’). If only she could find him. If only he could find her. Being without Carlos is not much (‘estando sin èl, no es mucho’). The Spanish text is inconsistent at this point. The whole monologue and the next few scenes are written in prose, but still presented as separate verses. What does this mean? It is striking at least that the nightly scenes remain unrhymed. In general, Spanish drama uses polymetric verse, but here it is completely absent. Fig 3. Folio F8r. from Mudanzas de la fortuna (1649) showing the absence of rhyme. Biblioteca Nacional de España, Madrid. Something is happening here, and there is also something strange about the Dutch adaptation. Heynck intensified Margareta’s emotions by turning her words into a song, but he also condensed them, partly also because he summarized the lengthy monologue of eighty lines in the Spanish original into two strophes of fifteen lines each. It is remarkable that Heynck chose to insert a song at the same specific moment as De Monroy de Silva disrupted his drama. Heynck’s source was a prose translation as delivered by Jacobus Baroces, the Sephardic Jew who delivered Dutch translations of comedias for the Amsterdam Public Theatre with its ongoing need for new material. Did Baroces in his prose translation indicate the rupture in the Spanish text? Or did Heynck see the unusual nature of this passage himself and did he realize its affective potential? 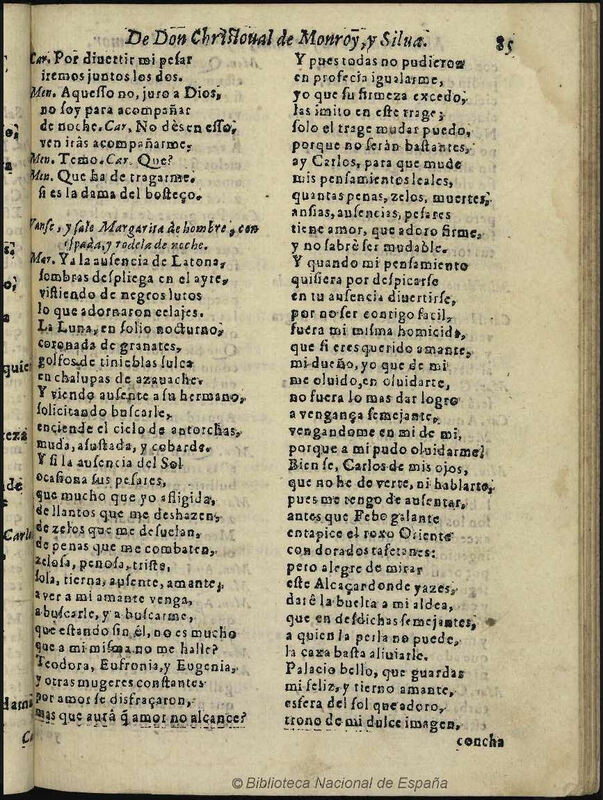 Or did he and Baroces converse about the adaptation and how to interpret certain aspects of the text, including the disruption of rhyme in the Spanish original? We cannot know for sure. Likewise, it is still unclear which melody was used in the Dutch performances. And without the melody a large part of our understanding of the emotional force remains in the dark. Nevertheless, the search for the right melody continues, both in Spain and the Netherlands. De Monroy y Silva, Cristóbal. Las Mudanzas de La Fortuna y Firmezas Del Amor. In: Doze Comedias Las Mas Famosas Que Asta Aora Han Salido de Los Meiores y Mas Insignes Poetas: Tercera Parte. Lisbon: Antonio Alvarez(? ), 1649. Heynck, Dirck Pietersz. Veranderlyk geval, of Stantvastige liefde: Bly-spel. Amsterdam: Jacob Lescaille, 1663. Jautze, Kim, Leonor Álvarez Francés, and Frans R.E. Blom. ‘Spaans theater in de Amsterdamse Schouwburg (1638-1672). Kwantitatieve en kwalitatieve analyse van de creatieve industrie van het vertalen’, De Zeventiende Eeuw. Cultuur in de Nederlanden in interdisciplinair perspectief 32.1 (2016), 12–39. Rodríguez Pérez, Yolanda. ‘“Neem liever een Spaans spel”. Nieuw onderzoek naar het Spaanse toneel op de Noord- en Zuidnederlandse planken in de zeventiende eeuw’, De Zeventiende Eeuw. Cultuur in de Nederlanden in interdisciplinair perspectief 32.1 (2016), 2–11. Van Marion, Olga, and Tim Vergeer, ‘Gezongen emoties. Toneelliederen in Rodenburghs Vrou Iacoba bij de opening van de nieuwe Schouwburg’, De Zeventiende Eeuw. Cultuur in de Nederlanden in interdisciplinair perspectief 30.2 (2014), 168–184. Van Marion, Olga, and Tim Vergeer, ‘Spains Dramatic Conquest of the Dutch Republic. Rodenburgh as a Literary Mediator of Spanish Culture’, De Zeventiende Eeuw. Cultuur in de Nederlanden in interdisciplinair perspectief 32.1 (2016), 40–60.